Liz and her older brother Michael Daley at Point Defiance Zoo in Tacoma, WA. Liz grew up in the North End of Tacoma in the Proctor District. Growing up she attended Washington-Hoyt Elementary and Mason Middle School. In 2003 She graduated from Stadium High School and went on to graduate from Western Washington University. Liz was very adventurous and was often outdoors with family or friends. Liz while working on a horse ranch. While attending college she became very familiar with Mt. Baker and began to fine-tune her snowboarding skills. During her summers she spent much time abroad traveling many countries with friends or working odd jobs to support her adventurous lifestyle. She went on several trips through Europe with friends and ventured through some countries on her own. After graduating with a degree in Environmental Education she accompanied her boyfriend Davide to Chamonix, France where they would spend many summers. Chamonix became a second home to Liz and Mt. Blanc (The highest European mountain west of Russia) was her play ground. 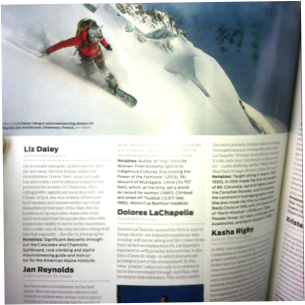 While in Chamonix she began blogging trip reports and making charming videos called, The Daley Splitter. Liz also conducted interviews for Epic TV, an extreme sports internet channel. Over the last 5 years she became one of the first professional female splitboarders. Many people she climbed with rode down on skis but Liz was more skilled and proficient at boarding so that is how she rode. Her skills, sense of adventure, and bubbly personality boosted her popularity in the mountaineering community and she was featured in many outdoor magazines. Liz climbing in Chamonix, France. Liz had been working towards IFMGA professional mountain guide credentials. In 2014 she received a scholarship from the American Mountain Guides Association to help her achieve her goal. While guiding Liz gained sponsorships from many outdoor companies including Jones Snowboards, Patagonia, and Eddie Bauer. Her most recent sponsorship with Eddie Bauer and engagement to Davide De Masi in 2014 was a huge turning point in her life and was thrilled for her future adventures. Unfortunately her first project with Eddie Bauer would also be her last. On September 29, 2014 she was killed in an avalanche in Argentina. Liz's death devastated many people around the world. Her spirit is celebrated by many with the phrase, "Live Like Liz" which embodies her zest for adventure, genuine disposition, superior fun having skills, and love for the outdoors. Since her passing multiple scholarships and projects have been set up in her honor including, The Liz Rocks Campaign in her hometown of Tacoma, WA.